Sleek and sophisticated. Modern and minimalist. Simplistic and understated. Angular and geometrical. Stylish and intelligent. 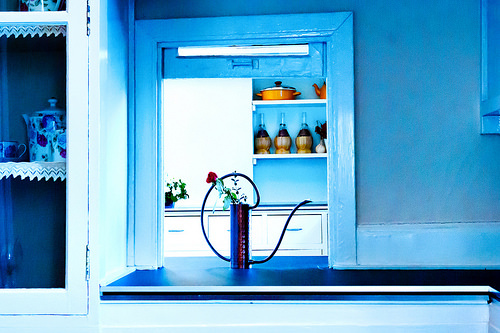 These are just a few of the words that come to mind when envisioning the modern kitchen. Choosing features that result in such a kitchen can seem daunting, but by sticking to clean lines, geometrical shapes, brushed metals, and simplistic patterns, the results can easily be achieved. 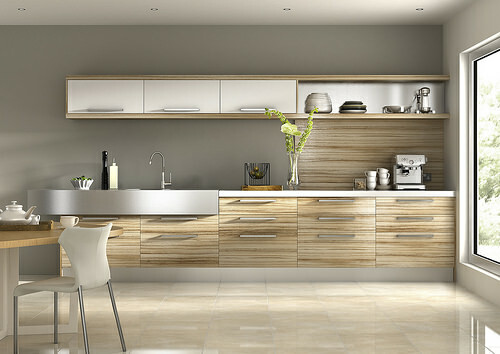 Cabinetry is one of the most important aspects when it comes to designing any style of kitchen. Because they will be the most prominent feature in both view and use, more care must be taken with them than any other part of the kitchen. This is especially true for residents of Brooklyn, Manhattan, or Queens, where apartments are often limited in size. For that sleek ultramodern look, cabinets should have as little embellishments as possible. Fine lines and sharp angles are what make the modern kitchen stand out, while extra embellishments and busy details tend to break up those lines. When choosing materials and textures for cabinets, it is important to take the other parts of the kitchen into consideration. Modern kitchens are all about simplicity and minimalism, and grainy wood can take away from that simplicity if not done properly. If the flooring is going to be detailed or there will be mosaic tiling on the walls, the cabinets’ grain pattern should be kept as simple as possible so the aesehteitc remains unbroken. A kitchen cabinet in an ultramodern style should also be built with space saving in mind — as any Brooklyn, Manhattan, or Queens resident will tell you — and have room for built-in features such as a pull-out trashcan and sliding cookware hangers. 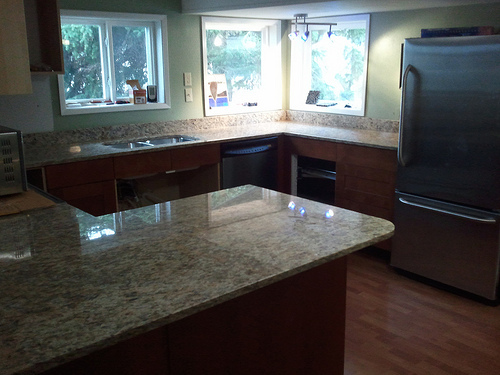 The constant companion of the kitchen cabinet, countertops should complement the cabinets in both color and pattern. 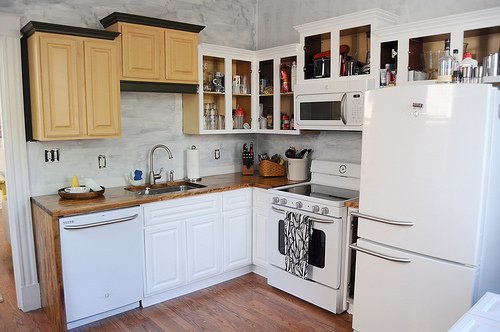 Similar to the cabinets, they should be free of embellishments and any details that will break up the lines of the kitchen cabinet and other parts of the kitchen. The same rules for cabinets apply to countertops, in that the simpler the rest of the kitchen is, the more leeway you have in this area. A kitchen with plain cabinets and a wooden floor can have a more intricately patterned countertop, whereas a kitchen with grainy cabinets and a mosaic backsplash should have a simpler countertop. Brushed metals such as copper or steel are the go-to for sinks and faucets in the ultramodern kitchen. Such metals add to the elegance of the look and help balance out the room’s palette. Matching the finish of sinks and faucets to the finish of appliances and cabinet fixtures also helps bring the room together. Undermount sinks are both stylistically and functionally preferable to overmount sinks. Functionally, undermount sinks will decrease the amount of water and food particles that get stuck between the sink and the counter, while stylistically, they maintain the clean lines that are the defining feature of modern kitchen. 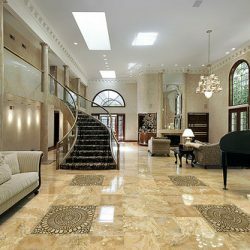 Flooring is also an important consideration in the modern design. Unlike cabinets, flooring has more leeway as far as textures and materials, because in comparison to the space that cabinetry takes up, it actually occupies less space. This is especially in a smaller Brooklyn, Manhattan, or Queens apartment. As before, the general rule is to take the other parts of the kitchen into consideration. The more detail your countertop has and the more intricate the cabinets’ grain pattern is, the more plain your flooring should be and vice versa.